I got a new hair-do today. 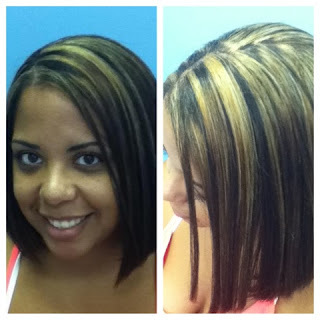 BLONDE highlights. I can hardly believe I did it... never went this light before in my life! But I feel like stepping out of my box more and more lately. I'm feeling pretty good. Today I was having a talk with my ex-husband about the amount of money that I'd been spending on ME lately. Nothing's changed much with my finances to make me be able to AFFORD to spend more money, unless you count that I am getting child support now. But that had nothing to do with the decision. I basically just decided that I'm worth it. I'm worth the $100+/month that I am spending on my Vi-shakes. I am worth new gym clothes because they make going to the gym a little more special since I feel like I look great while I am working hard. I am worth a new hairstyle because it bumps up my self-esteem a little. I am worth the new gym shoes I PLAN on buying because my feet DO NOT HURT when I wear good shoes when I exercise. AND I also plan to buy new compression socks because they also make my feet feel good when I exercise. I will pinch pennies somewhere else. I am saving a ton on groceries with couponing... so maybe that's a good place to start. I am also making less trips to Nashville, which equals more gas savings, too. It will all balance out. If I want it to. The point is, I can't continue to pour my investments (time AND money) into other people when I am not making an effort to invest in myself at all. I need it. I deserve it. Since I had my hair appointment during my gym time today I had to exercise later. I decided to go while my nephew was warming up for baseball, but remembered last minute that they childcare at my gym is closed on Friday evenings. Since my oldest daughter also wanted to work out, and since my ex-husband got off early today, I headed that way so he could babysit the two youngest kids. Since his apartment is close to the ballpark, and my gym is on the other side of town, I went down to the on-site gym where he lives. I knew about 5 minutes into my workout that I was dedicated, lol! First of all, the elliptical was broken, so I got on the stationary bike. My daughter got on the treadmill. It was about 100 degrees in there because the air was barely blowing a cool breeze. It was like working out in HELL. But I did 30 minutes on that bike and didn't pass out! I knew I didn't have time to drive all the way to the gym and get back before the game started, so it was HELL or no workout. And not working out today was NOT an option! I'm really glad to see you investing in yourself... You are worth it!!! You look FANTASTIC!!! Love the new look! love the hair Hollie, you are totally worth it!! Your hair looks amazing! It's such a great way to feel better about yourself, too. I usually feel guilty about spending money on myself but, as long as my boys are taken care of, there's no harm in it. Good for you for spending some hard-earned, well-deserved money on you! "The point is, I can't continue to pour my investments (time AND money) into other people when I am not making an effort to invest in myself at all. I need it. I deserve it." This is wonderful! I'm so glad you stopped by my blog and told me about your post. I totally agree with you. It really IS important to invest in ourselves. And I agree with the other comments, your new "do" is cute! u look great and u are absolutely worth it! I think as moms we can easily forget about ourselves! :) You better keep up the good work! I'm very proud of you on this journey! You are fantastic. Weight loss is hard, I've been through it myself. the hair looks great! it really is important to treat yourself to things that encourage you to keep working out and being on track. and go you for making sure you got your workout in despite those obstacles! Love your hair!! I've been contemplating a little splash of color myself but haven't bitten the bullet yet. I agree that new work out clothes and shoes can make a world of difference. And if it works, why change? Your hair looks great! I learned that investing in myself helps me to be a better person and that benefits those who are close to me. So, everyone WINS!! You are an inspiration, Thank you!